The designs and renderings we offer are highly flexible when it comes to all elements of the exhibit. Browse through the examples below keeping in mind that you can combine different features from various booths to create a display that works best for your brand and overall message. After looking through all of the unique options below to better identify exactly what you need, reach out to our team of skilled professionals to get a free rendering of your own. We provide our rental exhibits in New York and all around the US. 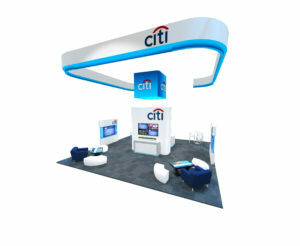 The Citi 30x30 trade show exhibit rental is a design that is sure to impress your competitors. It features a unique hanging sign that grabs the attention of everyone at the event. Additionally, seating areas and several interactive monitors included in this booth makes it even more inviting and attractive. 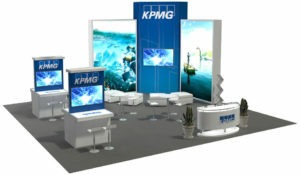 Separate yourself from fierce competition with a rental exhibit like that of the KPMG 30x30 booth. It includes two modern and unique lightbox displays as well as digital monitors that create a more interactive customer experience. Complete this rental with an inviting seating area that includes couches and stools to keep potential clients comfortable while they wait. 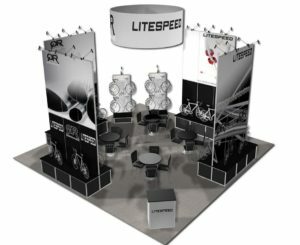 Amplify your brand's look with a booth design like the Litespeed 30x30 booth. This booth features several seating areas that are semi-private and serve as great spots for meeting with potential future clients. Additionally, this rental exhibit also features graphic panels with product fixtures that show off what your company has to offer in the best way possible. 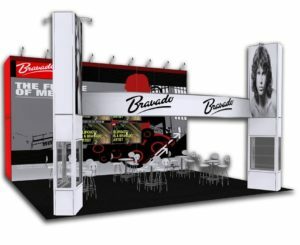 This Bravado 30x30 exhibit is one of our larger and more sprawling booth designs. This rental features an entire seating area in the center for show attendees where they can sit and discuss business. Digital monitors attached to the back wall graphic panels are designed to complement the brand's image. Additionally, glass product cases in the front provide the opportunity to display products to potential clients. 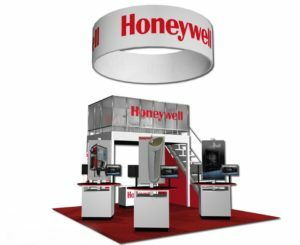 Really make your mark on the crowd at your next trade show with this 30x30 Honeywell exhibit. This rental features a double-decker layout. There is a meeting area located on the second floor where you can privately meet with potential and/or current clients to discuss business. Additionally. the exhibit features three kiosks and a large hanging sign. 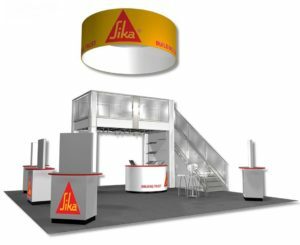 Another of our larger rental exhibits that features an upstairs meeting area is the Sika 30x30 booth. This design includes several customer kiosks, as well as a central reception desk. These features make it easy to interact with potential clients and educate them on what you as a company have to offer. 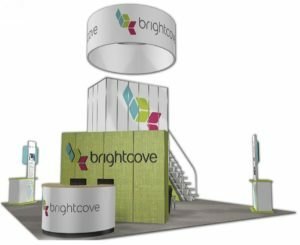 Another of our popular double-decker rental exhibits is the Brightcove 30x30 booth. It includes a staircase that leads up to a private meeting area where you can discuss business with potential clients. This display also features customer kiosks on each outer corner of the booth, as well as a curved reception desk and an attention-grabbing circular hanging sign. Find the design that is closest to what you're going for. Our designs don't stop there! We can provide customizable booth rentals of any size such as 10x10, 10x20, 20x20, 20x30, 30ft-100ft & more. Reach out to our experienced team trade show professionals so that they can guide you through trade show rules and design regulations for your particular event.